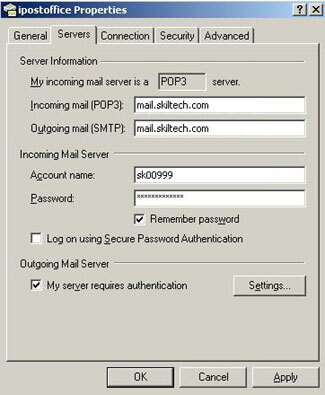 To add an e-mail account for sending and receiving e-mail messages in Microsoft Outlook Express 5.x and 6.x. 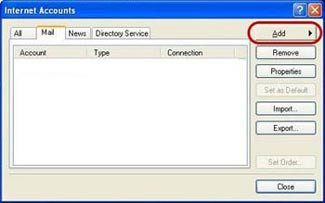 1- From the Start menu, select Programs, and then choose Outlook Express. The Microsoft Outlook Express window will appear. 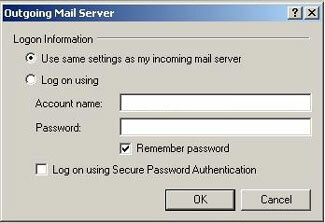 Note: If you are using Microsoft Windows XP, then from the Start menu, choose Outlook Express. The Microsoft Outlook Express window will appear. 2- From the Tools menu, choose Accounts. The Internet Accounts window will appear. 3- Click the Mail tab. 4- Click the Add button. 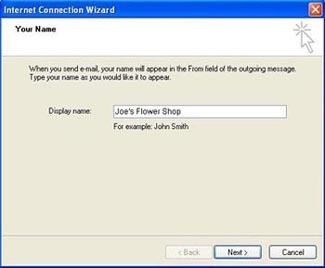 5- In the Display Name field, enter the name that you would like to appear in your e-mail messages and then click the Next button. Note: An example is Joe Smith or Joe's Flower Shop. 9- Click the Next button. 10- In the Account Name field, enter your SkilTech e-mail ID using all lowercase letters. Note: Your e-mail ID is the sk##### login number. 11- In the Password field, enter your e-mail password. Note: The password is case-sensitive and will not be visible as you type it. 12- Place a checkmark beside the Remember Password option if you do not want to have to enter your password each time you check your e-mail. 13- Click the Next button and then click the Finish button. 14- Click the mail account that you just created and then click the Properties button. 15- Click the Servers tab. 16- Place a checkmark beside the My server requires authentication option. 17- Click the Settings button. 18- Select the Use same settings as my incoming mail server option. 19- Click the OK button. You will return to the Properties window. 20- Click the Apply button, click the OK button, and then click the Close button.